A pioneer in the manufacture of automobiles since the early days of their design more than 100 years ago, Ford offers its popular compact SUV, the Escape, to drivers seeking a comfortable ride that includes plenty of perks. 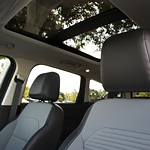 The Escape allows in plenty of light with a panoramic sunroof visible to back and front passengers alike. Thoughtful details like a heated steering wheel and ergonomic grips make driving a pleasure. Enable SiriusXM for entertainment options and use its available Traffic Travel Link for navigation. Equip the exterior of your Escape with an optional Sport package to add 19-inch wheels, a honeycomb front grille, black bezels on the headlights and tail lights and chrome detailing at strategic points. If you'd like to experience the Ford Escape for yourself, you're welcome to visit us at Sheehy Ford of Richmond. You can take one out on the road for a test drive and ask us any questions you may have about its many amenities.